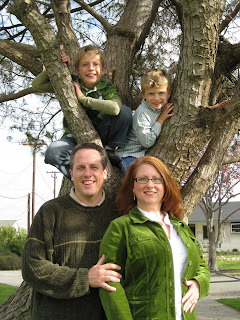 The tree in our neighborhood park where we took our most recent Christmas card photo was chopped down. I wasn't the only one who was stunned by it's removal. For the three days it took to get it down there was quite a crowd at all times. My boys were sullen about it. I can't blame them. I spent at least a third of my own childhood in a tree in our front yard, and at our current house there are two trees the boys have staked out for themselves. But this old friend is a horrible loss- even Michael, who grew up in this neighborhood, climbed it as a child. It was growing at an angle with some of the branches hanging over a concrete path. 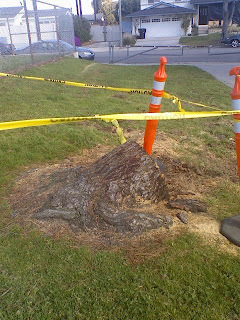 I can imagine that someone must have fallen, or perhaps the roots were interfering with something underground. When questioned, the city crew was non-committal. Whatever it was, this is one tree that will be missed.